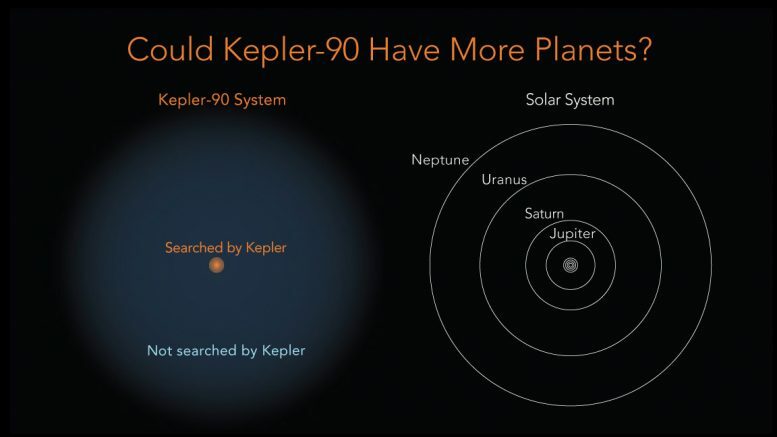 The discovery of an eighth planet circling the distant star Kepler-90 by University of Texas at Austin astronomer Andrew Vanderburg and Google’s Christopher Shallue overturns our solar system’s status as having the highest number of known planets. We’re now in a tie. The newly discovered Kepler-90i — a sizzling hot, rocky planet orbiting its star once every 14.4 days — was found using computers that “learned” to find planets in data from NASA’s Kepler space telescope. Kepler finds distant planets beyond the solar system, or exoplanets, by detecting the minuscule change in brightness when a planet transits (crosses in front of) a star. Vanderburg, a NASA Sagan fellow at UT Austin, and Shallue, a Google machine learning researcher, teamed up to train a computer to learn how to identify signs of an exoplanet in the light readings from distant stars recorded by Kepler. Similar to the way neurons connect in the human brain, this “neural network” sifted through the Kepler data to identify the weak transit signals from a previously missed eighth planet orbiting Kepler-90, a sun-like star 2,545 light-years from Earth in the constellation Draco. “For the first time since our solar system planets were discovered thousands of years ago, we know for sure that our solar system is not the sole record holder for the most planets,” Vanderburg said. Other planetary systems, though, would probably hold more promise for life than Kepler-90’s system, which packs all eight planets closer to the host star than Earth is to the sun. In our solar system, only Mercury and Venus orbit between our planet and our sun. About 30 percent larger than Earth, Kepler-90i is so close to its star that its average surface temperature is thought to exceed 800 degrees Fahrenheit, on a par with Mercury. The outermost planet, Kepler-90h, is a gas giant that is about the size of Jupiter, circling with a “year” of 331.6 days. The research paper reporting this finding has been accepted for publication in The Astronomical Journal. The idea to apply a neural network to Kepler data came from Shallue, a senior software engineer at Google AI, a research team at the search-engine giant in Mountain View, California. Shallue became interested in exoplanet discovery after learning that astronomy, like other branches of science, is rapidly becoming inundated with data as the technology for collecting data from space advances. Kepler’s four-year data set, for example, consists of about 2 quadrillion possible orbits of planets. To verify the most promising signals of planets, automated tests, or sometimes human eyes, are typically used, but often the weakest signals are missed during this process. So, Shallue and Vanderburg thought there could be some more interesting exoplanet discoveries lurking in the data. The two developed a neural network to search Kepler data for new planets. First, they trained the neural network to identify transiting exoplanets in a set of 15,000 previously vetted signals from the Kepler exoplanet catalog. Then, with the neural network having “learned” to detect the pattern of a transiting exoplanet, the researchers pointed their model at 670 star systems that already had multiple known planets and searched for weaker signals. Their assumption was that multiple-planet systems would be the best places to look for more exoplanets. 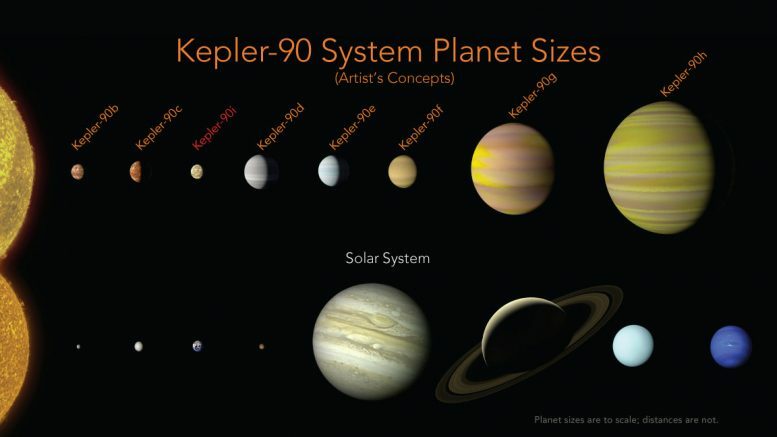 Kepler-90 had already made its mark in 2013 as the first seven-planet system identified with Kepler, but the signal from the eighth planet was so weak it was missed by previous methods. 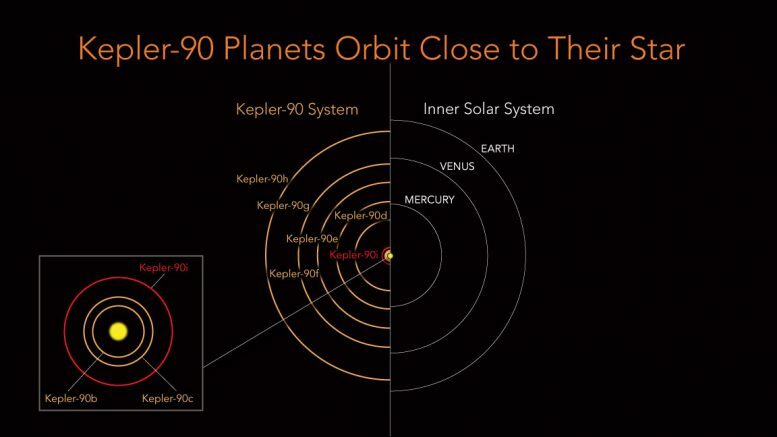 Kepler-90i wasn’t the only jewel this neural network sifted out. In the Kepler-80 system, they found a sixth planet. This one, the Earth-size Kepler-80g, and four of its neighboring planets form what is called a “resonant chain,” where the planets are locked by their mutual gravity in a rhythmic orbital dance. The result is an extremely stable system, similar to the seven planets in the TRAPPIST-1 system, so precisely balanced that the length of Kepler-80g’s year could be predicted with mathematics. This work was performed in part under contract with the California Institute of Technology/Jet Propulsion Laboratory, funded by NASA through the Sagan Fellowship Program and executed by the NASA Exoplanet Science Institute. 2 Comments on "Astronomers Discover Eighth Planet Circling Kepler-90"
I can’t help but suspect that some of these ‘planets’ are actually moons. We are not alone, that one is definite. Pity we may never have the know how to detect life in such distant places.